WhisperSense® DC™ Precision Spot Ventilation fan with built-in Dual Sensor Technology (Motion & Moisture) for automatic moisture and odor control. Features Pick-A-Flow™ speed selector switch to select required airflow (50-80-110 CFM) and ECM Motor with SmartFlow® technology for optimum performance. Can be used to comply with the latest codes and standards. WhisperSense DC is a precision spot ventilation fan that features built-in dual sensor technology (motion & moisture) that provides built-in redundancy for the ultimate in automatic moisture and odor control. WhisperSense DC improves IAQ by effectively removing moist, polluted air from any room. A powerful, yet efficient ECM Motor with SmartFlow™ technology ensures optimum CFM output, regardless of a long or difficult duct run. WhisperSense® DC™ is designed to perform as rated. When the fan senses static pressure, its speed is automatically increased to ensure optimal CFM output. Built-in Pick-A-Flow speed selector provides the unique ability to select your required airflow (50-80-110 CFM) with the simple flip of a switch. Variable humidity controls from 30-80% Relative Humidity (RH). Adjustable delay timer from 30 seconds to 60 minutes. The Flex-Z Fast™ Installation Bracket with articulating joints is ideal for positioning the fan exactly where you want it, in old or new construction. 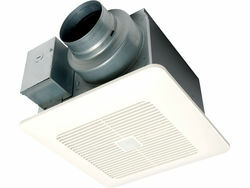 WhisperCeiling DC incorporates an integrated dual 4 in. or 6 in. duct adapter to give you flexibility in duct layout and design. Panasonic ventilation fans are ENERGY STAR® certified, where guidelines exist. ENERGY STAR® vent fans meet strict parameters set by the US Environmental Protection Agency (EPA). They provide better efficiency and comfort with less noise, and feature high performance motors and improved blade design, providing better performance and longer life. WhisperSense DC was awarded 2018 Most Efficient. This mark recognizes WhisperSense DC as delivering cutting edge energy efficiency along with the latest in technological innovation. It is an award that represents the best of those products that qualify for ENERGY STAR®. Grille Size (in sq.) 13"
Mounting Opening (in sq.) 10 1/2"